Network architecture is the design of a communication network. It is a framework for the specification of a network's physical components and their functional organization and configuration, its operational principles and procedures, as well as data formats used. In telecommunication, the specification of a network architecture may also include a detailed description of products and services delivered via a communications network, as well as detailed rate and billing structures under which services are compensated. 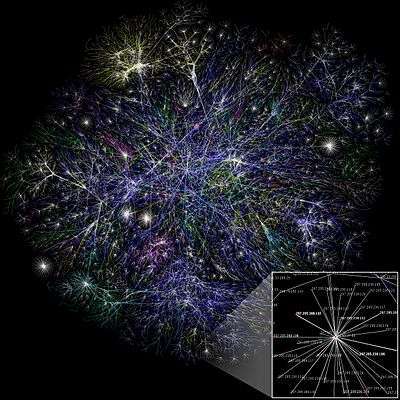 The network architecture of the Internet is predominantly expressed by its use of the Internet Protocol Suite, rather than a specific model for interconnecting networks or nodes in the network, or the usage of specific types of hardware links. The Open Systems Interconnection model (OSI model) is a product of the Open Systems Interconnection effort at the International Organization for Standardisation (ISO) . It is a way of sub-dividing a communications system into smaller parts called layers. A layer is a collection of similar functions that provide services to the layer above it and receives services from the layer below it. On each layer, an instance provides services to the instances at the layer above and requests service from the layer below. The physical layer defines the electrical and physical specifications for devices. In particular, it defines the relationship between a device and a transmission medium, such as a copper or optical cable. This includes the layout of pins, voltages, cable specifications, hubs, repeaters, network adapters, host bus adapters (HBA used in storage area networks) and more. Its main task is the transmission of a stream of bits over a communication channel. The data link layer provides the functional and procedural means to transfer data between network entities and to detect and possibly correct errors that may occur in the physical layer. Originally, this layer was intended for point-to-point and point-to-multipoint media, characteristic of wide area media in the telephone system. Local area network architecture, which included broadcast-capable multi-access media, was developed independently of the ISO work in IEEE Project 802. IEEE work assumed sublayering and management functions not required for WAN use. In modern practice, only error detection, not flow control using sliding window, is present in data link protocols such as Point-to-Point Protocol (PPP), and, on local area networks, the IEEE 802.2 LLC layer is not used for most protocols on the Ethernet, and on other local area networks, its flow control and acknowledgment mechanisms are rarely used. Sliding-window flow control and acknowledgment is used at the transport layer by protocols such as TCP, but is still used in niches where X.25 offers performance advantages. Simply, its main job is to create and recognize the frame boundary. This can be done by attaching special bit patterns to the beginning and the end of the frame. The input data is broken up into frames. The network layer provides the functional and procedural means of transferring variable length data sequences from a source host on one network to a destination host on a different network, while maintaining the quality of service requested by the transport layer (in contrast to the data link layer which connects hosts within the same network). The network layer performs network routing functions, and might also perform fragmentation and reassembly, and report delivery errors. Routers operate at this layer—sending data throughout the extended network and making the Internet possible. This is a logical addressing scheme; values are chosen by the network engineer. The addressing scheme is not hierarchical. It controls the operation of the subnet and determine the routing strategies between IMP and ensures that all the packs are correctly received at the destination in the proper order. The transport layer provides transparent transfer of data between end users, providing reliable data transfer services to the upper layers. The transport layer controls the reliability of a given link through flow control, segmentation/desegmentation, and error control. Some protocols are state and connection oriented. This means that the transport layer can keep track of the segments and retransmit those that fail. The transport layer also provides the acknowledgement of the successful data transmission and sends the next data if no errors occurred. Some transport layer protocols (such as TCP, but not UDP) support virtual circuits that provide connection-oriented communication over an underlying packet-oriented datagram network, where it assures the delivery of packets in the order in which they were sent and that they are free of errors. The datagram transportation deliver the packets randomly and broadcast it to multiple nodes. The transport layer multiplexes several streams on to one physical channel. The transport headers indicate which message belongs to which connection. This layer provides a user interface to the network where the user negotiates to establish a connection. The user must provide the remote address to be contacted. The operation of setting up a session between two processes is known as "binding". In some protocols, it is merged with the transport layer. Its main work is to transfer data from the other application to this application so this application is mainly used for transferred layer. The presentation layer establishes context between entities on the application layer, in which the higher-layer entities may use different syntax and semantics if the presentation service provides a mapping between them. If a mapping is available, presentation service data units are encapsulated into session protocol data units, and passed down the stack. This layer provides independence from data representation (e.g. encryption) by translating between application and network formats. The presentation layer transforms data into the form that the application accepts. This layer formats and encrypts data to be sent across a network. It is sometimes called the syntax layer. The original presentation structure used the basic encoding rules of Abstract Syntax Notation One (ASSN), with capabilities such as converting an BODICE-coded text file to an ASCII-coded file, or serialization of objects and other data structures from and to XML. The application layer is the OSI layer closest to the end user, which means that both the OSI application layer and the user interact directly with the software application. This layer interacts with software applications that implement a communicating component. Such application programs fall outside the scope of the OSI model. Application layer functions typically include identifying communication partners, determining resource availability, and synchronizing communication. When identifying communication partners, the application layer determines the identity and availability of communication partners for an application with data to transmit. In distinct usage in distributed computing, the term "network architecture" often describes the structure and classification of a distributed application architecture, as the participating nodes in a distributed application are often referred to as a "network". For example, the applications architecture of the public switched telephone network (PSTN) has been termed the Advanced Intelligent Network. There are any number of specific classifications but all lie on a continuum between the dumb network (e.g. Internet) and the intelligent computer network (e.g. the telephone network). Other networks contain various elements of these two classical types to make them suitable for various types of applications. Recently the context aware network, which is a synthesis of two, has gained much interest with its ability to combine the best elements of both. A popular example of such usage of the term in distributed applications, as well as PVCs (permanent virtual circuits), is the organization of nodes in peer-to-peer (P2P) services and networks. P2P networks usually implement overlay networks running over an underlying physical or logical network. These overlay network may implement certain organizational structures of the nodes according to several distinct models, the network architecture of the system. Network architecture is a broad plan that specifies everything necessary for two application programs on different networks on an Internet to be able to work together effectively. Computer Network Architects at the US Department of Labor.